“Do you like my frogs?” I asked him. We were in college and I adored him; I wanted his affirmation so badly. The frogs I referred to were in my hair. They were two of the cutest little green, ceramic frogs you’ve ever seen, and they sat on the ends of little bitty hair clips. They coordinated with my outfit, and I felt cute as a button. I wanted him to see the beauty and whimsy in my heart. “Yeah, if they were on my two-year-old daughter,” came his harsh response. Perhaps I shouldn’t have expected a man to be enthusiastic about hair clips, but I didn’t realize that at the time. I was crushed by his response. Those words stirred up years of feeling inadequate. When I was younger, I had been badly bullied. I remembered girls in the locker room who stole my clothes, didn’t invite me to parties, and openly mocked me in class and on the school bus. I remembered the nights I cried myself to sleep and the suicidal thoughts I battled. I remembered the hopelessness and despair of years of trying to fit in—trying, trying—to be good enough, pretty enough, funny enough. Anything to be loved; anything to be accepted for who I was. The memories hurt, and I had had enough. So I drew a line in the sand—a dark line. My battered soul could tolerate no more. I resolved to no longer open my heart to others or provide any opportunity for others to hurt me. I believed that if I could withdraw into a dark place, I would be safe within the shadows. I sadly took the frog clips out of my hair. I also took the hair bows, scarves, and headbands out of my wardrobe. I got rid of my sparkly makeup and glittery hair gel—things that used to bring the sparkle out in my personality. I no longer felt whimsical or beautiful, so I went down to the basics and didn’t look back … until 15 years had passed. I didn’t have a different purse for every outfit. I didn’t wear colored shoes or high heels 24/7. I would rather fast on bread and water for 40 days than wear a tutu or a boa in public (and I have zero desire to fast on bread and water, I assure you). Nothing about me sparkled during those 15 years. Yet, deep in my innermost heart, I missed the sparkle. Longed for it. Yearned to be whole again. I missed the hair bows. I missed whimsy and beauty. I longed to feel classy and elegant and ladylike again. I longed to let my personality shine … if only I could be safe. At the end of 15 years, my heart had still not healed, but I set a goal to “become more feminine.” I purchased a couple of books I thought would help me learn what women were supposed to look and act like. The first book, Becoming God’s True Woman by Nancy DeMoss, was a divine appointment for me. I never did read the whole book; only the first few pages. However, within those first few pages, DeMoss messed with me right away. “… when God created the first woman, he made a fully feminine creature. You and I did not become feminine because someone gave us a doll and put a dress on us—we were born feminine because we were created feminine” (page 25). That passage hit me like a freight train. I missed allowing myself to be myself in front of others. I longed to be able to show my personality on the outside of my self-created shadowland. I ached for the trappings of girlhood that I used to enjoy so much—for the beauty and elegance I associated with other women, but could not embrace for myself. I desperately wanted to feel like a woman again. Reading DeMoss’s words made me realize she was right: I didn’t have to try to be a woman. God already made me feminine, and nothing I could do would ever make me more feminine or more acceptable. He made me the way I am. The Lord spoke to me out of that book. He showed me that whether other people embrace who I am or not, I am still 100% woman, right now. Whether I am wearing hair bows, a dress, and high heels or flip flops and a t-shirt, I am still classy and elegant and beautiful … because God made me that way. When my husband and I went on a cruise, I purchased a fabric rose to wear in my hair on a formal night. It was black and white and beautiful, and it matched my evening gown. I knew no one would know me, so I planned to be brave and wear it … and I did. I rediscovered dresses. I have always felt elegant in dresses, but I had mostly abandoned them. One at a time, I found nice dresses to wear. I painted my fingernails. The great cloud of witnesses fainted, but the photo of my new red fingernails got lots of rave reviews on Facebook. I gave myself permission to be a woman. I gave myself permission to be who God created me to be. I gave myself permission to be myself, to feel beautiful, and to look my best. I gave myself permission to show the same fun and whimsy on the outside that God had placed inside my heart. It turns out that the trappings of feminine fashion weren’t the point at all. The point was—and still is—that God made me a woman, and I can rest in who he made me to be. I don’t have to try to be less than God made me. Instead, I can enjoy his creative work in me. I can embrace the full extent of beautiful womanhood, whether that means climbing the corporate ladder (at which I had already excelled) or wearing pink ballet slippers (which I bought when I began healing). 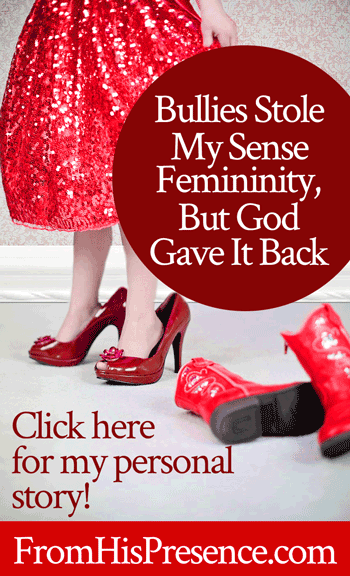 Beloved sisters, have you been through something that robbed you of your sense of femininity? Have you had to withdraw into a darker place in an attempt to protect yourself? Do you secretly long to let the beauty in your heart have its fullness of expression in every part of your world? God made you unique and powerful. He made you beautiful and special. He made you rare, a priceless treasure. When God made you a woman, he gave you a love for beauty and grace. He gave you the secret wishes of your heart. He made you mysterious and elegant. It’s who you are. You already are the woman you’ve always wanted to be. All you have to do is let her out. So go ahead. Take your Creator’s hand and step into this wonderful world of womanhood. Allow yourself to fully be who God crafted and formed you to be. The woman you are is a rare treasure, and the world is waiting to meet her. Does this testimony speak to your heart? If so, please leave a comment below. I’d love to hear from you! 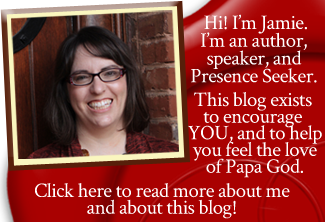 Hi Jamie, Thank you for your post! So brave and transparent and timely for me. I will enjoy my femininity more. Was recently blessed with my first grandchild, a little girl who loves jewelery. As I look for treasures for her, I happily find some for myself! Thanks for helping me focus on Papa God’s plan for my future. God’s blessings to you, your husband and baby son! Hi Jamie…thank you sooo much for sharing. I have been down that same road as well and still at times go back. I look at other woman and think, I want to be like them and have what they have and to be smart like them. I know the God loves me but at times I forget. We always feel that we are the only ones who go through stuff and no one else. Your story has changed my outlook and how God sees me and loves just as I am. A great woman of God. Thank you and May God Richly Bless you and your family. Awesome word! Thank you for putting to words what I have thought and still do at times. God is helping me to understand who I am and my uniqueness. I am fearfully and wonderfully made. Thank you, Jamie for your words and your sense of humor. I was told by family members that my mom and dad were disappointed that I wasn’t born male. For other reasons, I pretty much felt unworthy. I went into extremes to get the affection and attention I craved from men. I always did feel good about being female tho but never particularly was very foo foo. But after the Lord helped me to forgive those who I felt called me unworthy, the Holy Spirit called me Valuable. So I no longer call myself forgotten and desolate, but the Lord says, My delight is in her. Hi Amber. Thank you for reading. I’m sorry that happened to you. But, I’m concerned about your repeated use of the phrase “step into my power.” Could you please clarify what you mean? I’m not sure when I became aware that my parents still grieved the death of their first baby, a son who lived only a few hours. As I was a sponge for learning, some of that learning was absorbed from my father, who was a chemical engineer and taught me all kinds of things including house repairs etc. that in those days definitely were considered male work. I didn’t lack for learning on the feminine side. My parents certainly did not think of me as boyish or treat me weirdly. But I unconsciously took on a burden of also trying to be the son they lost although I did not realize that conflicting pattern until the Holy Spirit led me through that struggling sense of drowning femininity in my mid-20s. The brother of a Christian sister became somewhat like a brother to me and that friendship helped me to sort out exactly what you are talking about today. My self-awareness surfaced in poetry and paintings and decisions about clothing and even the kinds of food I ate. Many pressures in life have tried to erode that consciousness of womanhood so it is good to be reminded by you, Jamie, of that profound truth that endures lifelong, that we are created female and can make conscious decisions to celebrate God’s creation in us. This is good stuff, Jamie! I think we’ve all at times worried too much about what others think, forgetting that God created each of us to be unique and delightful in our own ways. Just knowing that He cared enough to take the time to do this is a good indicator of how He feels about us. Our value to Him is immeasurable. I love how you put it when you said: “When God made you a woman, he gave you a love for beauty and grace.” This is so true! Being a woman is hard sometimes, but as the old song says, “I enjoy being a girl”! Thank you so much for sharing! Thank you for the above. I went through a lot of bullying myself when i was young and felt rejected and abandones. it left me with wounds and scars and low self esteem. I only started noticing some of the effects of the bullying this year when i am already fully grown (33 years). Thank you very much for your articles there are a great inspirition and always talk to my life. Please never tire in making impact. you will always know that I will definitely benefit from yo blog. May God richly bless you. I do have a story that I could make it longer with the details, but I would like to sum it up, for it may help as well as your (history) story has helped, and will help many others who read your post. I was different when I was younger, because of some surgeries I had on my face as a baby, I was continually called names (that I didn’t want to repeat them, and will not repeat now), up into middle school, I had zero close friends! I had a sister that if she heard anyone picking on me, would beat them up (literally punching them in the mouth), and getting in trouble for fighting. But never telling why she fought. But when I got to middle school i found a friend who didn’t judge, didn’t make fun, and there were so many similarities in our lives and families that our friendship would last a lifetime. But then our family moved between my freshmen and sophomore year (no more dependable friendship in the beginning of the school year). I still had those scars from elementary school, belittled, mocked, they even spelled out U-G-L-Y, as if I didn’t know how to spell or read. because I tried multiple times to end my life, and of course they (the suicides) were never a success, became withdrawn socially, tried to get involved with sports, that’s another disappointment story in itself, went into a deep depression, stopped talking to family, plummeted myself in school work. -I have no job, no benefits, no spouse (my marriage was toxic, I encountered all kinds of abuses, ( I don’t have to list them here), but am so thankful that I was given the opportunity to go to the INNER HEALING RETREAT, and even though GOD has been healing me since my initial TOTAL SURRENDER TO HIM, I had received more healing there. So I want to add this here: I am sorry for others hurting you, but am thankful HE (DADDY GOD) had guarded you from things that would have kept you from going forth with THE INNER HEALING RETREAT. I am able to share things with them that, at times, I wonder how I even had the courage to speak into lives that are our next generation! -this part of the story I would like to share, that, Earlier this year as I was headed to the Sunday school classroom, The Lord dropped into my spirit to pray for those who are being bullied. So, because I am a volunteer, I asked for permission to do this, with an allotted time. That first time, over half of the class came up to be prayed for that were being bullied, and it happened the same with the following Sunday, only 9 came up that Sunday, but The Lord also told me to share about praying for those who spitefully curse you (those who are doing the bullying), how they are HIS children and if they (the bullies) are not fighting with HIM, they (the bullies) are fighting against HIM. The third Sunday in a row, The Lord told me to pray for the bullies and those who are being bullied and to share about myself! WHATTTTTT????? I did, and what happened to me after everyone left, was the realization that HE, THE HEALER, THE GREAT PHYSICIAN, MY BROTHER, MY BEST FRIEND (WHO, BY THE WAY IS THE ONLY ONE TO SAY AND FULLY KEEP THIS PROMISE OF NEVER TO FORSAKE OR LEAVE ME), MY TRUE ALL IN ALL, THE GREAT I AM, HE HEALED ME OF MY PAST rejections, disappointments, name calling, abuse (I was bullied in my first marriage), falsehood, my anger that I had kept in a secret corner of my being, GOD expose it and shared what happens if I choose to let it remain. Thank you for the opportunity to tell my bits and pieces story here, and to thank you for you always being an encourager, and a Beautiful and God-created and God-blessed, Hungry and Thirsty for not only HIS PRESENCE, but the bringing forth HIS GLORY WITH ALL HONOR AND GLORY DUE HIS NAME. You are a beautiful, feminine example of what a true woman of God Should be! Thank you for your transparent writing. I am on my way to teach at church tonight, feeling totally inadequate …following reading this post, I am going to wear sparkly earrings! Big hugs warrior sister. My motto”Never let anyone dull your sparkle”. Wear those earrings proudly. God bless and be free! The great cloud of witnesses fainted ! HAHAHAHA Jamie you crack me up! You are funny and cute and bold and brainy and full of God! The best thing about you…you are real, not someone who hides behind a painted on facade and pretends to be whatever people want you to be. You are REAL. Keep it real Sister! We love it! I don’t think you should consider it bullying if as an adult you ask another adult- regardless of whether they’re a man or a woman- “do you like frogs” and they give you a short answer telling you that only if it’s for their two year old- even if they liked you. Do you think that you were very immature here? Hahahaha you make me laugh! I didn’t know anybody noticed! 🙂 Go get you one, sista!